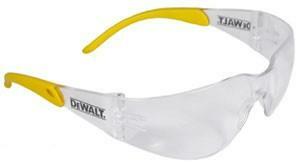 DeWalt Safety Glasses Protector Clear Anti-Fog Lens DPG54-11D feature a streamlined design, rubber tipped temples for comfortable fit, and a distortion free lens. The lenses are impact resistant and offer 99.9% UV protection. These lightweight glasses weigh less than 1 oz. Meets or exceeds ANSI Z87.1+ Standards.